With those words, you might think Jordan is an activist—he used to think he was, too. Before 2009, he also used to think the Pacific garbage patch was a Texas-size, photographable mass. 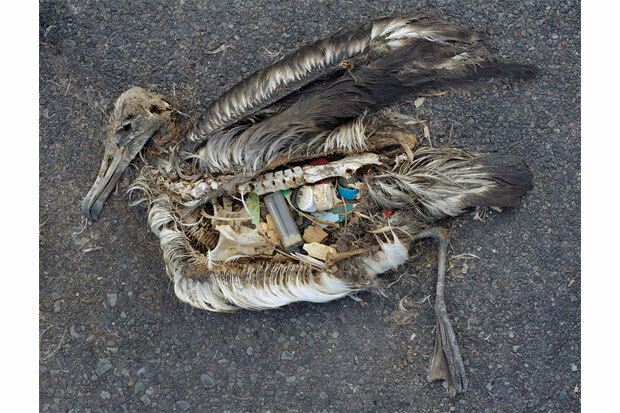 Then he went to Midway Atoll at the northwest end of the Hawaiian archipelago, part of the Papahānaumokuākea Marine National Monument, where he discovered the garbage hiding in increments within the bellies of birds. 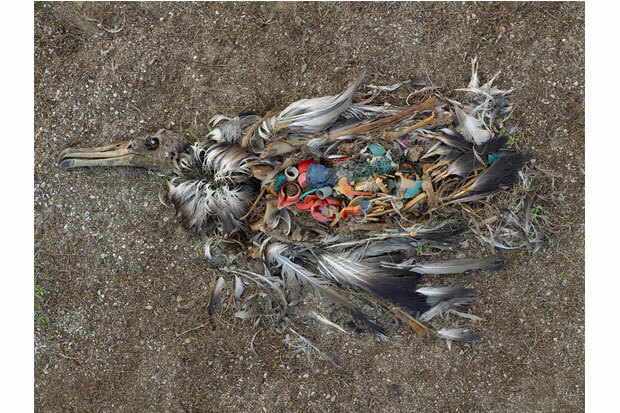 Over the course of eight trips, Jordan exposed his bare hands and rolls of film to scores of these dead albatrosses, the results of which became the photo series Midway: Message from the Gyre. Selections from that project are easily the saddest works visitors encounter at Plastic Fantastic?, and Jordan thinks that’s a good thing. 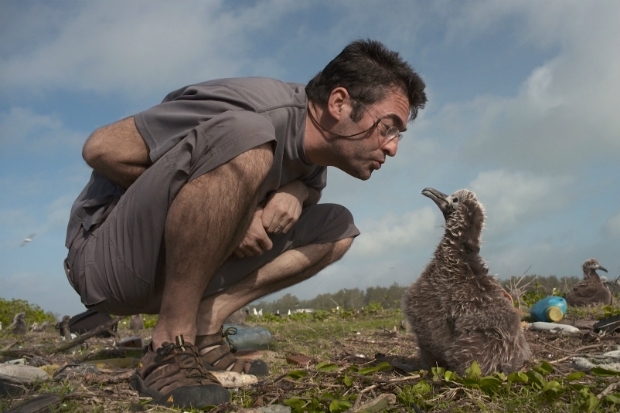 After seeing Midway Island during the albatrosses’ “dying season,” during which tens of thousands of fledglings annually die of mostly natural causes, and repeatedly documenting man’s unnatural augmentation of those numbers, Jordan now feels that the grief his photos cause can be as transformative for others as it was for him. In spite of the odds, Laysan albatross populations are growing, which for Jordan means conversations about them can be sad but hopeful, as they offer us what he calls “a kind of poetry coming from the earth,” a story with catharsis. Jordan is currently working to bring that message to a greater audience through a feature-length documentary. Last week, he took a break from editing that film to chat over the phone about his continually evolving perspectives on the birds, and on his own species. Plastic Fantastic? offers a comprehensive view of the idea of plastics in human use. Would you say your works in the exhibition are directly critical of plastics? I don’t really think of myself as being critical of plastics, but I am critical of the way we use it. There are some things that plastic is great for, like there’s no better way to make a motorcycle helmet, or lots of medical devices or computer keyboards, etc., and we’re not finding that stuff polluting the environment and killing all kinds of wildlife. The thing I’m critical of is the way we use plastic in this kind of disconnected and stupid way, primarily single-use disposable plastic like plastic bags and plastic silverware, just junky stupid plastics. So with that angle of critique, would you call your work activist in any way? I used to think of myself very much as an activist, and the more I experience that kind of vibe in the world, the less I like it because activists tend to tell people how to behave. I’m not here to tell anybody how to behave. I think it doesn’t work, and it’s not respectful and it’s just not effective. I think the role of the artist is a little bit different than that. I’m just here to connect my own self more deeply with what’s going on in our world, and to hopefully help other people connect with themselves and the world more deeply. And I trust that if I can help people reconnect, or connect more deeply with what they feel, then they’ll go behave in good, wise ways. 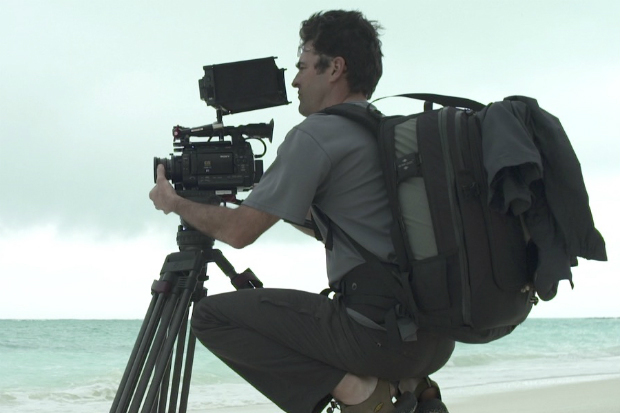 Chris Jordan filming on Midway Atoll. All images of artist courtesy of Chris Jordan Studio. So for you this has become highly personal as you explore your personal connection with wildlife through your camera? Yeah, I think in a strange way the most powerful way to reach a kind of universal experience is to just go deeply into one’s own personal experience, and my own journey over my eight trips to Midway has been a transformational, healing experience for me in a way that I never anticipated. I started out my first trip to the island in a place of horror. My first trip was a very dark experience. The first several trips were just dark experiences of death and horror and god-awful birds filled with plastic. It wasn’t until several trips in that I began to really experience the beauty of these birds, as kind of the antidote to the horror. That’s been the shape of the journey for me as I slowly found my way to love these creatures, and that’s really what my film is about more than anything—just how amazing and beautiful and magnificent they are. I think the Laysan albatross is a spiritual being. They are amazing beings and the fact that they have plastic in their stomachs is just a stupid thing; it’s not the main event. When I first started, the horror was the main event. Now the horror is just something to deal with amidst the enormous beauty and grace and magnificence of these creatures. Was it difficult to get to Midway Island, with it being in a protected marine monument? Yeah, it’s quite a challenge to get permission to go to Midway. It took me about six months to get a permit. It took a lot of wrangling. We applied for a permit and they took a look at my work and saw that I’m a guy who loves to take photographs of horrible piles of the things we waste and I think they were concerned that I was going to make their beautiful new marine national monument look like a horrible garbage dump. It took a long time to convince them that I should go there and that I was going to be doing good work. When you roamed the island looking for subjects, did you find plastics naturally exposed or did you have to get your hands dirty? Well, the first time we went the birds were just decomposed and open on the ground. But the next couple of times, we were there as the birds were dying, and the biologists [stationed on Midway] showed me how to do a necropsy—to take a pair of scissors and open up the bird and find where its stomach is and find what’s in the stomach. We did maybe 50 necropsies and filmed them all. In terms of hands getting dirty, they gave me these gloves and they said, “Don’t ever touch the birds with your hands because you’ll get a horrible sickness.” But the gloves were so gross, like these sort of disgusting latex gloves, that pretty soon I just ditched them and did it with my hands. So most of the video we have is just with my bare hands opening up birds’ stomachs and putting the plastic directly into my hands. I never got sick, but there’s some footage of me totally losing it. I got a whole handful of plastic that I took out of a bird and suddenly just collapsed into tears at the horror. Is there anything you would suggest that people keep in mind as they visit or revisit your photos of the birds? There is one thing, which is that I intend my Midway project as a kind of grief ritual. That is really kind of the heart of the project for me. What I mean is that as a culture we tend to live in fear of grief. So if there’s something that makes us feel grief we push that feeling away, because we associate grief with despair or depression or something. I did a lot of grieving on Midway, and I did a lot of reading about grief, and I’ve come to believe that it’s actually a transformationally powerful experience. There’s something really important about grief. It’s different from despair and sadness. Grief is the same as love. It’s a felt experience of love for something that we’re losing or have lost. And maybe at no other time do we feel our love for something so much as when we’re losing it, be it a person or anything that we love. In that way, feeling our grief for what’s being lost in our world reconnects us with our love for the world, and helps us to feel our love for something that we might not even have known that we cared about. It’s kind of a transformational shock for me to realize that I love albatrosses, because I’ve never thought about albatrosses in my life. I didn’t know that I cared about them at all. Grief reconnects us with our love for all beings, because there’s nothing more lovable or amazing about albatrosses than any other creature. Plastic Fantastic? is on view at Spalding House through October 2, 2016. Posted in Exhibitions, photography, Spalding House · Tagged: Chris Jordan, Midway Project, Plastic Fantastic? In relation to the Midway photographs, Jordan created another project that was going to be a documentary. It was about the pollution on Midway Atoll called “The Midway Film Project”. The project was successfully funded on Kickstarter with over $100,000 worth of donations. There has been little activity regarding the project (since 2014) I too paid into this fundraiser after having being deeply moved by the trailer. I am extremely disappointed to be left with the unanswered question Where is the film?